We bought these under cabinet lights at a garage sale, but a strand of 3 costs about $10 new. The best part? You can plug them into a regular outlet, without professional installation. I took this photo so you could see how we stapled the cord to the underside of the cabinet. The pucks don't show at eye level. 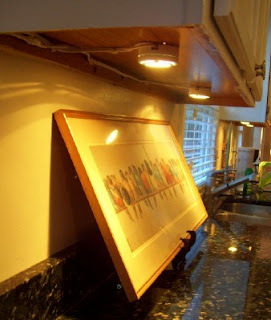 Under cabinet lights add a lot of ambience, especially when you flip off the overheads. I noticed a GE ad in Traditional Home which offers a sweepstakes and free DVD about home lighting. Fluorescents strips use the least amount of energy, and LED lights are even dropping in price. Just a word of warning -- they do throw off a ton of heat (we had them in our computer room and finally replaced them with florescents because it got too hot). They look great! The print on your countertop is beautiful - I would be afraid it would get damp or get water damage. Lovely Meredith! I'm waiting until we move before I do this because I agree about the ambiance! We installed some cheap flourescent under cabinet lights in the kitchen a few years ago and I LOVE them!! They are similarly installed. Though we have three wired together on one side of the kitchen, we can light them individually. It's great for preparing a snack in the evening and just lighting one, or to light them all for ambience when we have guests. I like the looks of your little disc-type lights a lot! That looks very calm and inviting! I absconded the halogen strip light from under an old office desk my husband was throwing out (the old particle board kind, it had died a painful death). The light is perfect for the corner are of my cabinet/counter where not much light gets in. It's lovely to have that extra light when I'm working with my mixer. How lovely! I am going to look into those! !